I’ve been getting Google alerts on the word “jellyfish” since 2010. For eight years a daily roundup of jellyfish news from across the web has been rolling across my inbox in the mid-afternoon. I’ve seen most of the stories several times. I’ve seen giant jellyfish drifting near video cameras on oilrig platforms that are mistaken for whale placentas. They turn out to be really strange and stunning jellyfish called Deepstaria. I’ve seen Michiganders and Missourians surprised August after August when the freshwater jellyfish Craspedacuspa pops into medusa form in nearby lakes. But back in July, I saw something I’d never seen before. In a video taken off the Italian island of Pantelleria half way between Sicily and Tunisia, the camera pans in on a vertical field of dandelion yellow cup corals on a rocky green wall. The corals have long, eyelashes of tentacles that sway gracefully in the surge. Roundish crimson encrusting creatures, maybe sponges or bryozoans along with sprays of pink sea fans, provide a lovely accent to the vista. The camera draws closer and you see, suddenly, that all is not peaceful in this otherwise marine-pastoral scene. A translucent form appears ghostlike from the lower left of the frame. But it’s not a ghost because it doesn’t waft like a ghost. It moves with urgency. And you quickly recognize that the form is a jellyfish, pulsing its teacup-sized bell at top speed to no avail. It moves nowhere because two of its oral arms, the veil-like extended lips that hang from its mouth, have been caught in the grip of two of the berry-sized coral polyps. This species of jellyfish is called a mauve stinger, a medusa common to the Mediterranean that lives its entire life afloat, unlike the vast majority of jellyfish that settle down for a while, like the coral, and live a moored part of their life as a polyp. The jellyfish is also a terrible stinger that I’ve seen leave tattoo-like welts on swimmers. In the video, the camera pans to the left, revealing another mauve stinger similarly bound by all four of its oral arms in four different coral mouths. It’s bell collapses into the fray of coral, where many mouths are ready to seize upon it. The video shifts to still photographs of corals, consuming the gelatinous strands of jellyfish from opposite ends, like the Lady and the Tramp slurping on opposite ends of spaghetti. 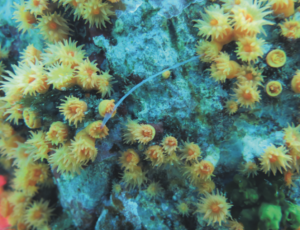 According to reporting in National Geographic by Christie Wilcox (who wrote the terrific book Venomous), after the first sighting of this medusivory by corals, other scientists began looking for it, and found it. In just a few years, they documented 20 mauve stingers being devoured by corals. Searches through the scientific literature uncovered more examples: mushroom corals eating moon jellies in the Red Sea and sea anemones eating spotted jellyfish in Indonesian marine lakes. How do the corals deal with the brutal sting of the mauve stinger jellyfish? No one knows. But Christie suggests that maybe because corals and jellies are cousins, they’ve got some sort of immunity against familial toxins. How does a tiny, stationary coral actually grab on to a swimming jellyfish that’s fifty times bigger? It would be like if I were trying to grab and hold on to a hot air balloon as it was being boosted skyward. The scientists suggest that maybe the capture has to happen under an overhanging wall. The jellyfish get swept up and stuck, or at least slowed, which allows the corals time to grab hold. 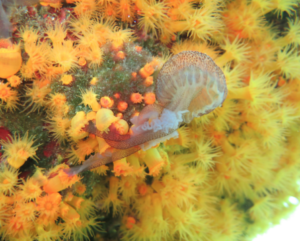 And most tantalizingly, do the individual coral polyps coordinate with each other? The answer to that seems to be yeah, kind of. These corals live in a colony, which means their stomachs are effectively joined together and they share nutrition with each other. Unlike many shallow water corals, these corals don’t have symbiotic algae that provide the nutritional boost of photosynthetically-produced sugars. So for these creatures, grabbing food from the floating plankton buffet is the sole means of survival. Imagine what it must feel like when a boondoggle like a jellyfish gets served up. It would sure help to have some backup, which is why the scientists who studied the behavior speculate that corals actually work together. Evolution would select for it, they say, because it would give a real metabolic advantage. Specifically, the scientists describe the type of cooperation between the different coral polyps as “protocooperation.” And I didn’t know what that meant, so I Googled it. Turns out the term was coined by Eugene Odum, who, with his brother, published the only textbook on ecology in the 1950s, Fundamentals of Ecology. I happen to have the third edition, published in 1971, on my bookshelf. On page 211, Odum defines all of the types of interactions between two species (in this case, interpreted as individuals). There are nine of them. Odum assigns a negative sign (-) to an interaction that makes life worse, a + to one that makes it better, and a 0 if it does neither. Each interaction gets two scores, one for each creature. For example, parasitism is + – since the parasite wins and the host loses. Protocooperation is + + and it’s defined as “an interaction favorable to both but not obligatory” In other words, both the polyps benefit from catching the jellyfish, but neither is going die if they work together to try to catch a jellyfish and it escapes. I like the implied flexibility of the words “not obligatory” in the definition. It’s not do or die. It’s about possibility. I haven’t opened this book for twenty years, but just as back then, it’s nearly impossible for me to read the text without thinking about human society, about all the interactions that go on between us as people, as groups of people, and how we enhance or detract from each others’ lives. For me, someone who sometimes finds human responses to situations confusing, there’s great comfort in the idea of categorizing relationships into nine simple, definable types. (It’s probably the same reason I get distracted by those personality tests on Facebook too. For the record: Lady Mary) Especially now, with so many of us facing off on opposite sides of arguments, the temptation for classification and for simplification is really enticing. But turn the page and Odum goes on to say that communities are complicated and not only will you find all nine types of interactions in most communities, even for a particular pair, the type of interaction is likely to change at different times. 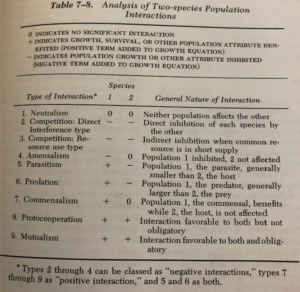 “Thus, two species might exhibit parasitism at one time, commensalism at another, and be completely neutral still another time.” Nothing is ever simple. Categorization crumbles in the face of reality. Which at first seems utterly disappointing. But actually, this complexity is where the hope lies: nothing is permanent. We who find ourselves faced off against each other, will inevitably shift our points of view. Just how is the question. I want to believe Odum who finishes the section on interactions with this optimistic statement, “In the evolution and development of ecosystems [and here I read society] negative interactions tend to be minimized in favor of positive symbiosis that enhances the survival of the interacting species [and here I read groups of people]. In other words, we should take a hint from the corals: the future is protocooperation. Focus on the possibility. Posted in Blog and tagged coral, Jellyfish, mauve stinger, Mediterranean.